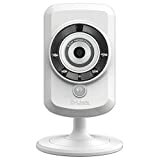 Amazon has the D-link dcs-942L record &amp; playback Wi-Fi camera (white) for $69 with free shipping. Sells for $111+ Highest Price. Deals for $59 Lowest Price. Normally $76+.